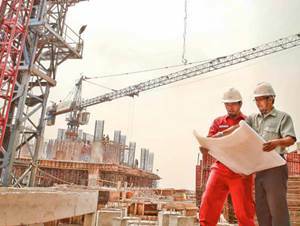 PT Hutama Karya (Persero) - PT HK or referred to as "Hutama Karya" is one of the largest state-owned companies in Indonesia that is involved in general construction services, EPC and investment. Having over 56 years of operating history in Indonesia, Hutama Karya has become one of the country’s largest general construction company. PT Hutama Karya (Persero) was formed by the Government of Indonesia in 1961 as a nationalization results of a Dutch East Indies general contractors company named Hollandsch Beton Maatschappij. Based in Jakarta, the Company now has 10 division units and 7 regional areas throughout Indonesia. Hutama Karya also supported by 3 directly-owned subsidiary companies and 6 affiliated companies. Its subsidiaries include PT HK Realtindo (99.75%), PT HK Infrastruktur (99.75%), and PT Hakaaston (99.75%). Hutama Karya's affiliated companies comprise of PT Hutama Prima (30%), PT Menara Antam Sejahtera (20%), PT Prima Terminal Petikemas (15%), PT Kasa Marga Bali Toll (1%), PT Takenaka Indonesia (1.07%), PT Gorontalo Energy (1%). According to PT Hutama Karya (Persero) Annual Report 2015 as quoted by JobsCDC.com, Hutama Karya managed to recorded good performance in the business year of 2015. Hutama Karya booked total revenue of Rp 6,315.78 billion in 2015. This total revenue reflected an 10.47% increase from Rp 5,717.07 billion in 2014. Referring to its annual report, Hutama Karya recorded a growth of 74.52% in total income for the year amounted to Rp 251.21 billion as compared with Rp 143.94 billion in 2014. Graduated from State University (Fresh Graduate). Willing to be placed on the entire working area of PT. HUTAMA KARYA (Persero). Strong academic results with minimum GPA of 2.85 for state university and 3.00 for private university (A accreditation durings 3 years). Maximum age of 24 years old for S1. Operating knowledge of Microsoft Office / Open Office (Word, Excel, Project, Power Point). Mastering web based programming, PHP, Database Postgree, MYSQL, Framework (S1 IT). Have a good health with proportional appearance and minimum height of 162 cm. Highly power struggle and highly driven with a strong commitment in achieving career, personal, organizational goal and have a good teamwork. JobsCDC.com now available on android device. Download now on Google Play here. Please be aware of recruitment fraud. The entire stage of this selection process is free of charge. PT Hutama Karya (Persero) - Fresh Graduate Program Hutama Karya July 2017 will never ask for fees or upfront payments for any purposes during the recruitment process such as transportation and accommodation.